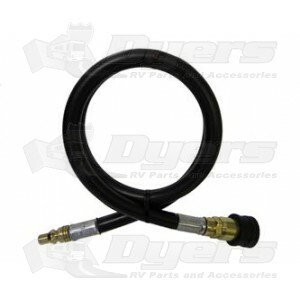 This Dual Quick Connect hose is used to connect a portable camping appliance with a quick connect plug inlet to a female quick connect attached to the RV. Dual Quick Disconnect Plug hose assembly used for connecting a small portable camping appliance such as a grill, heater, or lantern with a Male QD Plug in the inlet to a Female Quick Disconnect permanently attached to the piping system. Allows complete breakdown of the appliance and hose. 1/4" ID Thermo Plastic Hose Assembly including a 1/4" Model 250 Male Quick Disconnect Plug X 1/4" Model 250 Female Quick Disconnect.